Kaiser presents at BRAZ-TESOL in Brasilia, Brazil. 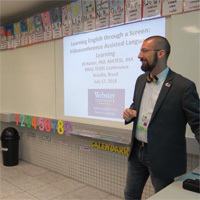 DJ Kaiser, associate professor and coordinator of Teaching English as a Second Language in the School of Education, recently completed his Faculty Research Grant activities in Brazil. Created by the Office of the Provost and Academic Affairs, the Faculty Research Grant program encourages and promotes faculty research and professional development with grants for scholarly research, academic projects, artistic performances, exhibitions and studies in any discipline. Applications are solicited each fall. As part of Kaiser's grant activities, he spent more than three weeks in Rio de Janeiro to observe classes in a project called EnglishWorks, managed by Sequoia Foundation, which partners with various public entities in the city of Rio to provide free English language classes in areas of critical need. Classes incorporate language instruction through videoconference including remote teachers from Canada to model English for students and then opportunities for communicative practice with a proficient English speaker via Skype. In 2011, EnglishWorks started offering free English classes to 160 adult learners in two locations of Rio. They now offer courses in nine different Naves do Conhecimento (“Knowledge Vessels”) around the city serving approximately 3000 students per 40-week course. These Naves serve as community centers where residents can go to use computers, enjoy free Wifi, watch movies, and take classes. All services are free to community members. Sequoia quickly expanded into a new project called Casa Futuro Agora (“the House of the Future Today”) in 2016 and is already offering free English classes to students ages 12 to 17 in eleven different locations. While visiting the Casa Futuro Agora location in Gardênia Azul, a reporter for Rio Solidario [in Portuguese] interviewed him on his research and perceptions on the program. Left: Kaiser in Prazeres, a favela in Rio, with Maria Clara, a teacher for EnglishWorks. Right: Delivering a workshop assisted by telepresence from the Nave do Conhecimento in Triagem. In total, Kaiser visited seven Naves do Conhecimento and attended the grand opening of a new Nave in the same building with the new Olympic City Museum. “The mayor was there and we were briefly introduced,” said Kaiser. “He said he liked my bow tie.” Kaiser also visited six of the Casa Futuro Agora locations. In total, he observed eighteen different two-hour English classes throughout Rio de Janeiro at thirteen different locations. EnglishWorks was designed to bring high-quality English classes to citizens of Rio who may not have good access to classes because they live in neighborhoods where many teachers would refuse to go. Travel within Rio is also difficult, making it difficult for those who want to study English to get to other neighborhoods that have English classes (if they can afford them). The projects Naves do Conhecimento and Casa Futuro Agora bring facilities and classes to these neighborhoods. Students also have opportunities to take classes in computers, poetry, and other topics depending on the project and location. Opportunities in Disenfranchised U.S. Communities? In addition to observating classes, Kaiser gave two workshops on Strategies for Teaching English. These workshops were attended by EnglishWorks teachers and area public school teachers. Participants had the opportunity to attend from other Naves that were connected through telepresence. During his three weeks in Rio, Kaiser had the opportunity to get to know many of the team members, including the program directors, coordinators, and the Brazilian teachers that help their students understand the English content and prepare them to use their new knowledge for communication. At the end of the three weeks, Kaiser shared his impressions with the team and provided some suggestions to further strengthen their projects. He then traveled to Brasilia with many EnglishWorks team members to attend the BRAZ-TESOL conference. BRAZ-TESOL is an affiliate organization of TESOL International Association, of which Kaiser is a member and currently participates in the Standards Professional Council. In the past year he presented at three other TESOL affiliate conferences: MIDTESOL in Iowa, AMTESOL in Alabama, and TESOL Arabia in the United Arab Emirates. At BRAZ-TESOL, Kaiser delivered a new presentation on “Learning English through a Screen: Videoconference Assisted Language Learning,” in which he presented on his recent Fulbright research in Uruguay on Ceibal en Inglés and his Faculty Research Grant project in Rio on EnglishWorks. Time in Brasilia also provided additional opportunities for Kaiser to meet with the EnglishWorks team to discuss their projects and provide some suggestions directly to some of the teachers in the project. Before returning to St. Louis, Kaiser is traveling to Peru to meet English language teaching specialists in the Ministry of Education in Lima, and returning to Montevideo, Uruguay for a week for a few final meetings about his Fulbright research.